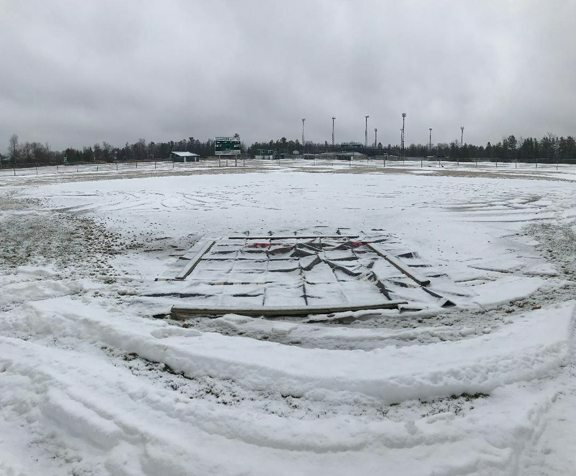 News Photo by Jonny Zawacki The Alpena High School girls softball field is just one of many area ball fields covered with snow due to the latest winter storms. The first two weeks of the spring sports season has been cancelled and it looks as if it could be a while before teams take the field. Here we are, nearly halfway through the month of April in Northern Michigan and snow is still visible, temperatures remain low and the spring sports teams are forced to wait it out. The first two weeks of the spring sports schedule have been canceled due to late storms and weather conditions that continue to affect the area. Athletic directors, coaches and athletes are becoming impatient and doing everything they can to stay busy so that once the teams are able to compete, they are ready. “It’s difficult. We have been bombarded with bad weather over the past few weeks and most of the teams haven’t been able to get outside yet, and if they have, it’s been very limited to what they can do,” Posen athletic director and softball coach Wayne Karsten said. A snow storm last weekend delayed the spring season even more and with another snow storm this weekend, the spring schedules may continue to shrink. Athletic directors and coaches are trying to come up with different ways to get on the field, but it appears the only option for area teams to get contests in now is to travel south. The only area team not affected by the weather is the Alpena girls tennis team which may continue to reap the benefits of the unplayable weather conditions as it has the luxury of competing in the APlex in Alpena. The girls tennis team already had one road match switched to a home contest and may have more to come in the next few weeks. The other area sports such as baseball, softball, golf, soccer and track are not nearly as lucky. The Alpena track teams had a meet in Davison canceled Friday and both teams spent time working together throughout the past week to shovel snow off of their track. 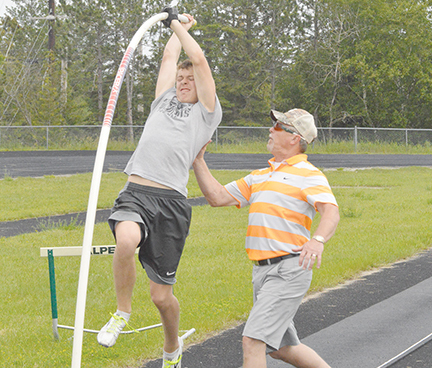 All area track teams continue to wait and do the best they can to keep their athletes sharp for the upcoming season, but for individuals competing in certain events, it has been a challenge. The Alpena boys golf team has been stuck inside so far this season and has just been working on putting until the weather warms up. Until then the Wildcats are staying focused on what they can control until they can get outside to work on other aspects of the game. Baseball and softball teams also are forced to play the waiting game. Most fields in Alpena, Hillman, Rogers City, Posen, Alcona, Atlanta and Onaway among others are covered with snow. Not only are the teams waiting for warm weather and a little rain to help erase some the snow, but they’re hoping it happens fast as the teams also will need to give the fields a chance to thaw out and dry before before being able to play on them. 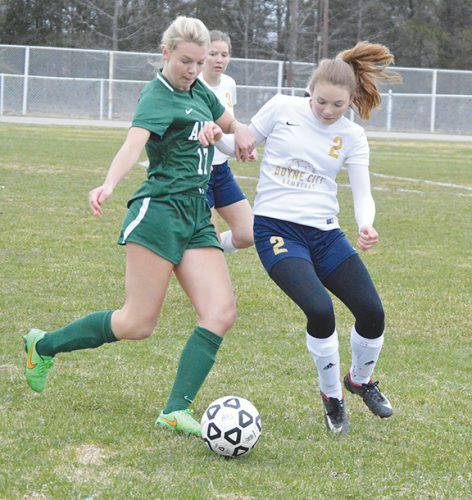 Alpena may be able to get on the field quicker than some of the area teams as it travels further for Big North Conference play. For North Star League teams, it may be more of a challenge as a majority of the teams are within several miles of each other. Ideas have been thrown around and it’s possible that schedules could be cut in half if teams aren’t able to get on the field before May. 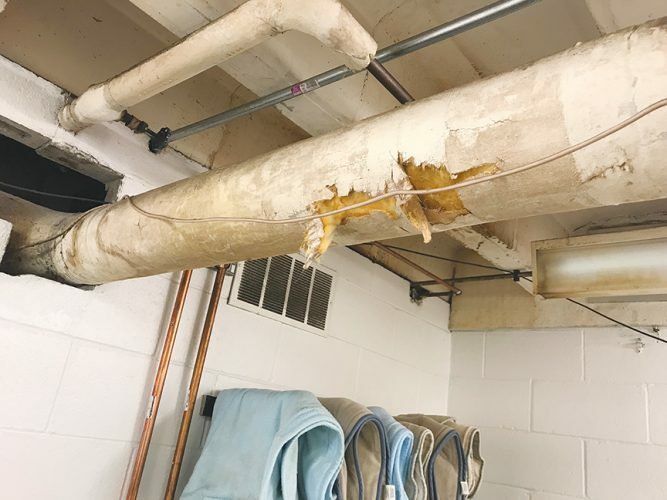 This will result in a four week season resulting in three to four games a week, which will cause issues for area baseball teams. The pitch count rule will be the biggest factor as pitchers are limited to a number of pitches they can throw in a given week. Teams also may look to use different locations around the area if fields are available to play league games. One of the biggest disadvantages for all spring sports teams being affected by the weather is they likely will have a shortened season, meaning teams will be forced to get league contests in first, leading to teams having to drop early season competitive games against top opponents from around the state. 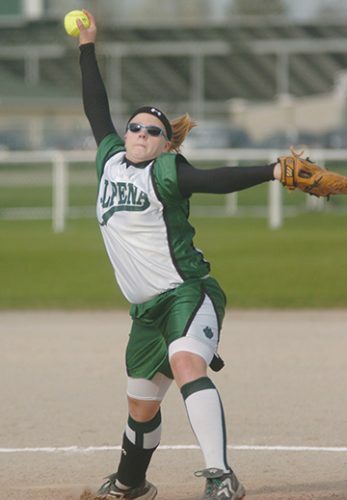 Teams with high expectations such as the Alpena and Rogers City softball teams and Alpena, Onaway and Hillman baseball teams already may be a month behind teams they may see later on in the postseason. Mother Nature has certainly thrown a curveball to all of the spring sports teams and it is one that has buckled knees and sat many down in disbelief.